The MTV Movie Awards is a film awards show presented annually on MTV. The nominees are decided by producers and executives at MTV. Winners are decided online by the general public. Presently voting is done through MTV's official website through a special Movie Awards link at movieawards.mtv.com. The most recent award show took place on April 9, 2016. Winners are presented with the "golden popcorn" statue, made by New York firm, Society Awards. Unlike its sister event MTV Video Music Awards (which are broadcast live), the MTV Movie Awards (up to 2007) were taped and then broadcast a few days later. The entire production was taped in a completely different order than what the MTV viewing audience saw. For example, the show's host would tape all his/her monologues and introductions at one time, and all the musical acts would perform one after the other. Celebrities would often only appear at the live taping for the announcement of their award category, and members of the general audience fill their vacant seats during the other times. 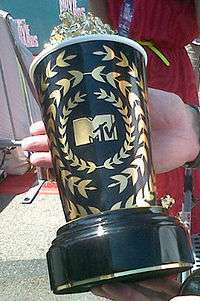 Through editing, MTV was able to present to its viewing audience an awards show which appears to be taped in live sequence, with celebrities remaining for the entire show. This method of production allowed profanity to be edited from the show and also is more convenient for the celebrities. The actual live taping aired same-day on pay-per-view channels in most metropolitan cities around the world. Some awards telecasts had also been shown in television syndication. However, in 2007, this changed, as MTV and Survivor producer Mark Burnett (who took over duties from Joel Gallen for the 2007 awards) announced that the 2007 edition would be broadcast live on MTV for the first time on June 3, 2007 in Los Angeles. The Lifetime Achievement Award was a tongue-in-cheek award for movie personalities who made an impact on popular culture. Prior to announcing the winner MTV would air testimonials from major Hollywood celebrities praising the winners greatness while only offering a slight tease as to who the winner was. Following Clint Howard's win and emotional reaction the award was discontinued. It was awarded to three fictional characters (Godzilla, Jason Voorhees, and Chewbacca) and Richard Roundtree's win was for his performance as John Shaft. Emma Stone was awarded the first MTV Trailblazer Award on 2012. ↑ "2015 MTV Movie Awards - MTV". mtv.com. ↑ Palermo, Elizabeth. "Golden Globe Creator eyes the Prize All Year Long". www.businessnewsdaily.com. ↑ Josef Adalian. "Burnett signs to MTV Movie Awards". Variety. ↑ "Jamie Foxx to receive the MTV Generation Award at the 2013 MTV Movie Awards". HitFix. ↑ "Breaking News - '2006 MTV Movie Awards' to Honor Jim Carrey with Coveted 'MTV Generation Award' & Spike Lee's Epic 'Do the Right Thing' with 'Silver Bucket of Excellence' - TheFutonCritic.com". thefutoncritic.com. ↑ Chip_douglas (1 July 2007). "1992 MTV Movie Awards (1992)". IMDb. ↑ "1993 MTV Movie Awards (1993)". IMDb. ↑ "1994 MTV Movie Awards (1994)". IMDb. ↑ Bradpittsbabe11 (28 May 2002). "1995 MTV Movie Awards (1995)". IMDb. ↑ "1996 MTV Movie Awards (1996)". IMDb. ↑ amber_waves (27 February 2001). "1997 MTV Movie Awards (1997)". IMDb. ↑ Cinema Buff (31 August 2001). "1998 MTV Movie Awards (1998)". IMDb. ↑ Willow192 (3 April 2001). "1999 MTV Movie Awards (1999)". IMDb. ↑ Willow192 (3 April 2001). "2000 MTV Movie Awards (2000)". IMDb. ↑ "2001 MTV Movie Awards (2001)". IMDb. 18 December 2001. ↑ anna (20 August 2002). "2002 MTV Movie Awards (2002)". IMDb. ↑ tahirjon6 (11 June 2003). "2003 MTV Movie Awards (2003)". IMDb. ↑ bsinc (23 June 2004). "2004 MTV Movie Awards (2004)". IMDb. ↑ kechupydeath (19 August 2005). "2005 MTV Movie Awards (2005)". IMDb. ↑ bob the moo (5 July 2006). "2006 MTV Movie Awards (2006)". IMDb. ↑ amblin53. "2007 MTV Movie Awards (2007)". IMDb. ↑ Armagedd'NSync is not a traditional movie spoof, but rather a trailer parody created by an independent director Russell Bates. However, according to the creator's web-site (last retrieved on 13 August 2006), it has been featured at MTV Movie Awards 1998.